Rural culture and the industrial economy are at odds. 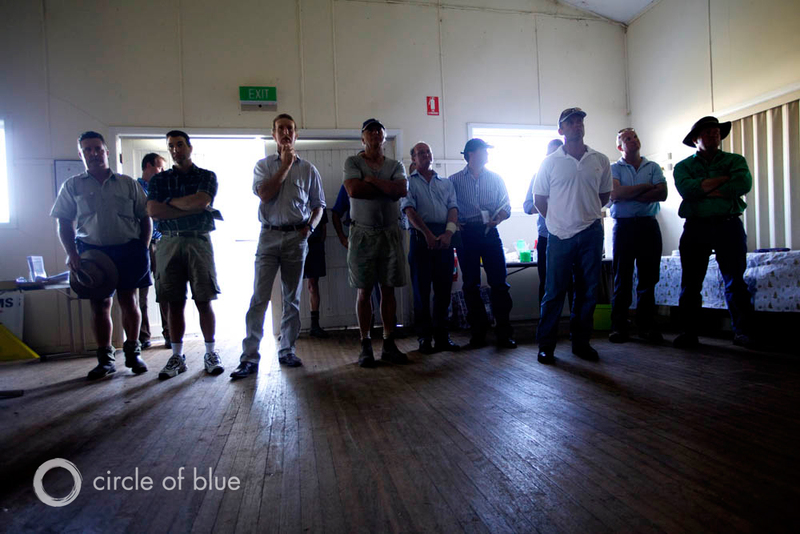 Farmers from the Liverpool Plains region gather in Mullaley, New South Wales, to attend a town hall meeting about the progress of coal seam gas development. Residents here worry that the energy sector could damage aquifers traditionally tapped for irrigation and domestic uses, pollute and deplete water supplies, and reduce the capacity of food-producing land. GUNNEDAH, Australia — The scale and rapid development of Australia’s coal seam gas industry is changing the social fabric of the country’s small towns and farming regions. Drilling has bruised agriculture’s ego by challenging the decades-long idea that rural areas should be quiet places where landowners have the biggest say. Click to see our Interactive Map of where we went in Australia. Click to launch the photo slideshow. In the Liverpool Plains and elsewhere, the energy industry is bringing hundreds of temporary workers to cohesive small communities and steadily changing the landscape with wells, gravel roads, pipelines, and collection ponds that farmers say are obstructing their cropping patterns. Furthermore, building wells on farmland also lowers the value of surrounding farming properties, while returning little of its big profits back to the local economies, according to some economic reports. “We’ve talked the talk for the last three years. Now we’ll have to prove we’ll do no harm,” said Mark Rodgers, a former farmer who is now employed as the Gunnedah region’s land access coordinator for Santos, an Australian energy company. But even as both sides argue, often talking past each other, the one impediment that cannot be ignored, say geologists and hydrologists, is the water supply. Third-generation farmer Bill Hobson’s field is adjacent to a pilot production site for CSG driller Santos. In the background, two massive water storage tanks are used to capture wastewater that is pumped up from the wells. Coal seam gas, also known as coal-bed methane, is a gas that occurs in underground coal seams, where it is trapped by natural water pressure. To extract the gas, companies drill a steel-encased hole into the coal seam and pump out the water inside, which releases the pressure and forces the gas to flow to the surface. Though most coal seams are located below aquifers used for domestic supplies and irrigation, critics worry that the drilling process could foster migration between underground layers. There are also concerns about the quality of the well casing, the potential depressurization of the water aquifers, and the sinking of surface land that goes with it. A major concern is hydraulic fracturing, which involves blasting water mixed with sand and chemicals into coal seams with low permeability, to free the gas trapped inside. The process uses between 100 to 10,000 cubic meters (26,000 to 2.6 million gallons) of water per well and is put into practice on about 8 percent of coal seam gas wells in Queensland. That percentage will likely increase to 25 to 40 percent, as wells age and the gas becomes more difficult to extract, according to CSIRO. Critics fear that the “fracking” technique could create fractures in the seams that could propagate through the coal-bearing layers and leak contaminated or briny water to other aquifers. But some scientests say the risks have less to do with hydraulic fracturing than with the quality of the gas wells. Energy industry executives and the hundreds of people employed in the coal mines and gas fields in Australia have a differing view. They assert that critics exaggerate the dangers and that markets both inside and outside of Australia are eager for the coal and natural gas that the nation supplies. Moreover, the development of Australian coal seams for natural gas is part of a global fossil fuel boom that is recharging economies in the West, shifting the balance of trade, and prompting record growth in Asia. Energy and agriculture — Australia’s two great primary industries — are some of the largest users of water in the country, as they are in most other industrialized nations. And in the states of New South Wales and Queensland, which share distinction as some of Australia’s most important food and energy development zones, the challenge of ensuring adequate, clean water and land for both industries has not been assured. In a nation buffeted by recurring droughts, it is not surprising that public anxiety about the gas industry has grown dramatically as the energy sector has stepped into highly productive agricultural regions. Soaring energy production requires a lot of water in a nation that is already over extracting from its rivers and aquifers, primarily to supply the farm sector and growing cities. Over the next 25 to 35 years, the coal seam gas industry alone could pump between 300 million and 1.5 billion cubic meters (80 billion and 400 billion gallons) of water annually in Queensland and New South Wales, the two states at the epicenter of the nation’s hydrocarbon boom. This is between two and nine times more than what the entire mining industry is currently using in these two states. And, some experts say, it could add even more stress in a region that is already extracting 23 times as much water for agriculture than for mining. “These water systems are already vastly over-extracted, and there are very severe environmental consequences [to taking additional water],” said Dr. James Pittock, researcher at the Australian National University in Canberra, the nation’s capital. Agriculture currently comprises about half of Australia’s water use, down from 65 percent during the 2004-05 fiscal year, when a dire drought in the country forced many farmers to vastly improve their water practices. Reining in often wasteful water use by irrigators is at the center of a controversial plan to manage Australia’s largest river system, the Murray-Darling Basin, where current extraction does not leave enough water for the environment. But ensuring enough water for farming is an important priority in a dry country that sources more than 10 percent of its GDP from agriculture and prides itself as a major global food exporter. The nation is also quickly becoming a major global energy exporter, however. There is rising demand for natural gas — particularly in Asia — and Australian companies are eager to produce the resource from coal seams, shipping it as liquefied natural gas (LNG) to China and other customers. According to industry estimates, Australia has about 250 trillion cubic feet of coal seam gas reserves, enough to power a city of 1 million residents for 5,000 years. The Great Artesian Basin, among the world’s largest underground water reserves, is a major source of water supplies to farms and cities. It also underlies most of the nation’s coal and coal seam gas reserves, as well as Australia’s ailing Murray-Darling Basin. Current total extraction from the Great Artesian Basin is about 540 million cubic meters (143 billion gallons) a year, or almost twice as much as the coal seam gas industry is expected to pump out from underground aquifers each year, according to Australia’s National Water Commission. 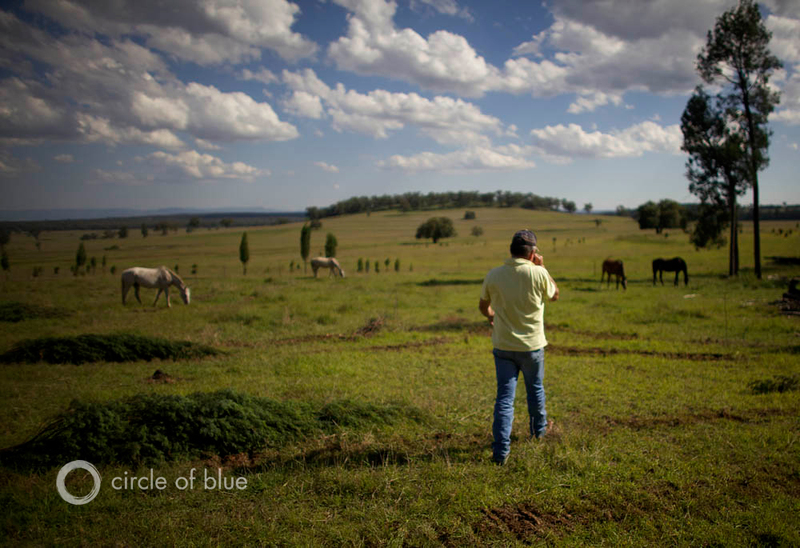 A farmer tends horses and herds of sheep on his 450-hectare property on the Liverpool Plains in New South Wales. Australia’s recent decade-long drought forced him to sell his cattle. Now he worries that coal seam gas development in the area could threaten the water resources and further devalue his land. In other words, the risk is not so much of the Great Artesian Basin being depleted as it is what to do with all that produced wastewater. Critics say that the drilling process could foster leakages between different underground layers or that it could depressurize clean aquifers, making it harder for farmers to access their water. They also fear that coal seam extraction and conversion to natural gas could produce large quantities of wastewater, which is often a salty brine that requires treatment. Although some companies have proposed to treat and inject the produced wastewater back into aquifers, the majority is treated in facilities on the ground and later released into streams and rivers. Additionally, the tens of millions of tons of salt, which is a by-product of extracting and treating the briny underground water, is largely stored in evaporation ponds — and can escape in floods — though state governments want companies to convert the salt into marketable products. 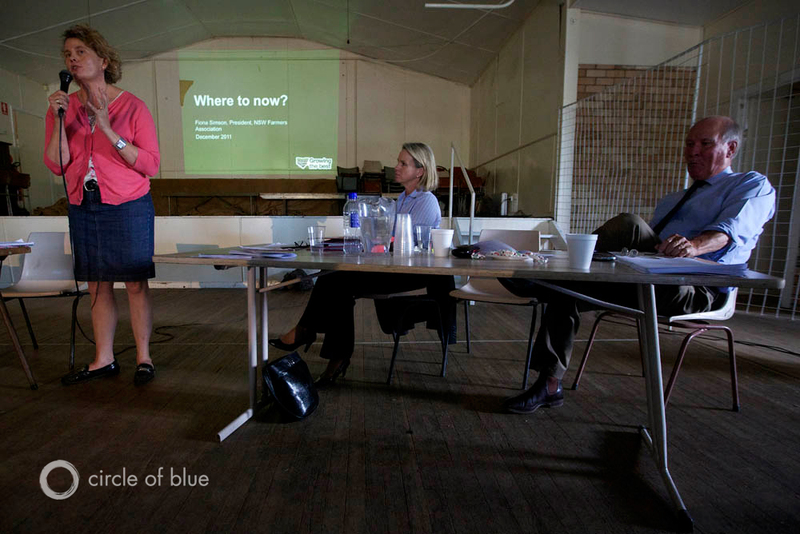 Senator Fiona Nash and Tony Windsor, Independent Member of the Australian Parliament, listen as Fiona Simson, the president of the New South Wales Farmers Association, addresses a December town hall meeting of 100 people in the Liverpool Plains. Australia has no comprehensive studies of the cumulative effects of the coal seam gas industry on the environment. Just as in North America, where runaway development of deep oil and gas shales has outpaced responses by federal and state regulators, Australia’s oversight community is struggling to keep pace. As a result, just as has occurred in New York in the United States, citizens have called for a moratorium of coal mining and coal seam gas operations on fertile land, like the Liverpool Plains. The energy industry has opposed the calls for moratorium, saying that more exploration will also inform better science. In January, Queensland implemented Australia’s first law intended to protect prime agricultural areas from mining, drilling, or urban development. But the law covers only about 4 percent of the Australian state that is the size of Texas. Critics also say it will only apply to open-pit mining, and it will not cover underground mining, exploration work, or coal seam gas production. The New South Wales government is currently entertaining similarly controversial measures to regulate energy industry activities across farmland, wineries, and horse studs. At the end of January, the federal government appointed an interim committee of experts to provide independent scientific advice on coal seam gas and large coal mining in Australia. The government is investing AUS$ 150 million iton the project that will eventually establish an Independent Expert Scientific Committee. Its goal is to provide more certainty for regional communities around jobs, investments, the energy industry,, and the protection of water resources. “I think the issue that solves the dilemma here is objective science, not science driven by mining companies or any science driven by a farming organization. It is objective science that will actually tell us if we know enough about this to allow the activity to proceed, ” Tony Windsor, Independent Member of Parliament and resident of the Liverpool Plains, told Circle of Blue. Australia’s federal parliament has given Windsor and two other independent MPs unusual leverage in national politics. 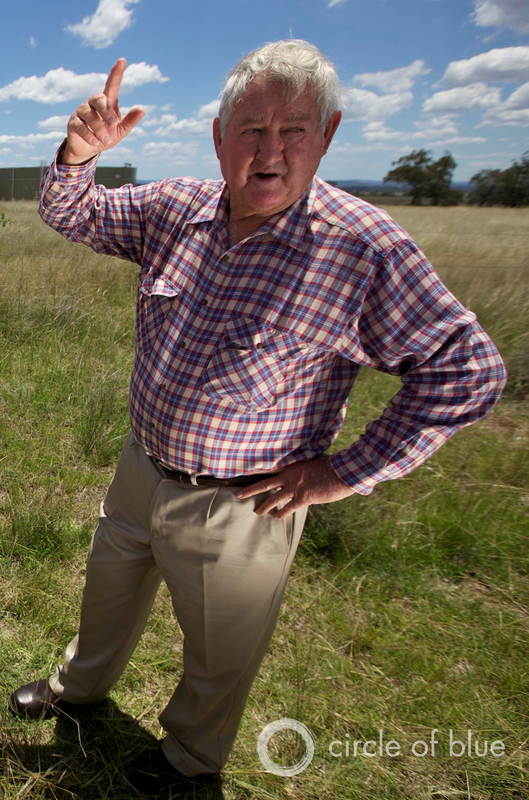 He was among a group of politicians that brokered a federal bioregional assessment — also partly funded by energy companies — of the cumulative effects of coal mining and coal seam gas operations in the Namoi water catchment area, including the Liverpool Plains. The report is due this spring. Yet, despite potential problems for both water supply and quality, Australia’s coal seam gas production has more than doubled over the last decade, according to the Reserve Bank of Australia, emerging as a booming AUS$ 70 billion industry, particularly in Queensland, where 9,000 workers are employed in the gas industry. Throughout Queensland — and more recently in New South Wales — gas companies are steadily piercing the landscape with drilling rigs. Hotels and motels around construction sites are full. Workers fly in and out. Television stations air daily commercials highlighting the benefits of the gas industry for regional and state revenues, jobs, and even for the farmers themselves. According to Federal Resources Minister Martin Ferguson, current investments could propel Australia from the world’s fourth-largest LNG exporter to the second, after Qatar, and perhaps even the largest, by 2018. The industry says it has been producing coal seam gas in Australia for 15 years and that better science and safety measures mean that water quality and supply will not be affected. Yet, according to Dr. Peter Stone, scientist at the Commonwealth Scientific and Industrial Research Organization (CSIRO), there is still very little understanding of the actual effects of the industry on water reserves. “What we are seeing today is a great deal of concern or debate of what may happen, more than specific instances of impact,” he said. Meanwhile, farmers are pressing the government to undertake research on gas drilling’s effects on water supply and the treatment of the large quantities of wastewater produced. Moreover, farmers and environmentalists — once unlikely partners — are forming coalitions to respond to the new risks to water supply, now that the energy industry has entered the arena as a stakeholder. Rural landowners are concerned about the potential that the energy sector will pollute and deplete water supplies, damage aquifers traditionally tapped for irrigation and domestic uses, and reduce the capacity of food-producing land. Environmentalists worry that the growing energy industry will take from the environment’s ever-declining share of water. Nowhere have the interests of Australia’s two primary industries — agriculture and energy — clashed more heavily in recent years than in the Liverpool Plains of northwestern New South Wales. Just outside the Hunter Valley, the region is endowed with rich black soil, good climate, and generations of farming ethos that make it some of the best agricultural land in Australia. 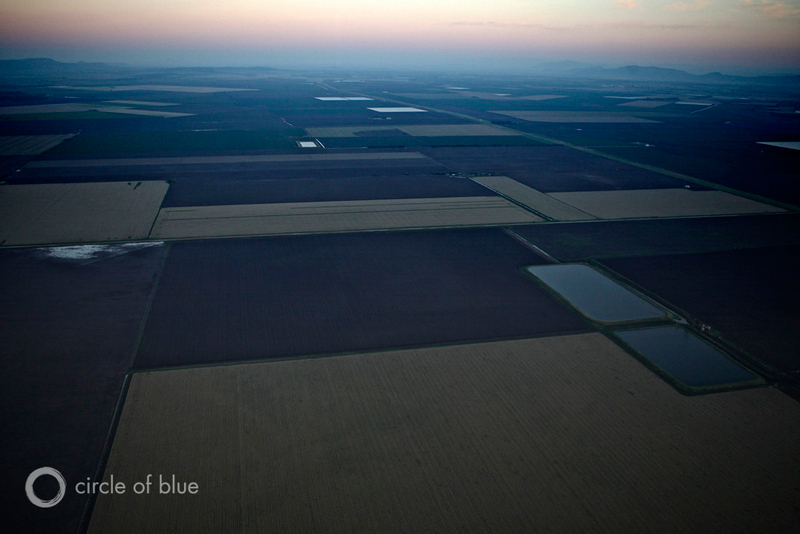 In the dawn sunlight, fields and irrigation ponds shimmer on the Liverpool Plains, where the promise of big gas reserves has prompted soaring energy production. In Queensland and New South Wales, the coal seam gas industry alone could pump between two and nine times more water annually over the next 25 to 35 years than what the entire mining industry is currently using in these two states. And, some experts say, it could add even more stress in a region that is already extracting 23 times as much water for agriculture than for mining. Normally mingling at tennis and tea parties, Liverpool Plains farmers are now bonding at protests and blockades against Santos, which plans to drill for coal seam gas in the region. The company currently operates six exploration licenses and several pilot testing wells in a region that spans about 22,000 square kilometers (8,500 square miles), and it plans to start commercial gas production around 2017. “It is wartime. There is no question agriculture is fighting for its life,” farmer Tim Duddy says, his voice building to a slight crescendo. As he speaks, the sun lights the long table in his front yard that he has just set with hot tea, milk, scones, marmalade, and honey. Many of the Liverpool Plains protests against the energy industry are organized by Duddy, who serves as a spokesman for the Caroona Coal Action Group, a community organization. Duddy’s house is on a small hill, overlooking grazing cattle and fields of cotton, sorghum, canola, barley, sunflowers, and corn. His property also sits on a mining exploration lease by BHP Billiton, a coal mining company. The small hills just beyond could soon be host to a proposed open-cut mine for Shenhua Watermark, a subsidiary of Shenhua Energy, the Chinese state-owned giant. Both the mining and gas projects have farmers worried about the consequences for underground aquifers, as well as the dust and noise effects. Landowners insist that the energy industry will irrevocably change their farming. They also question the value. 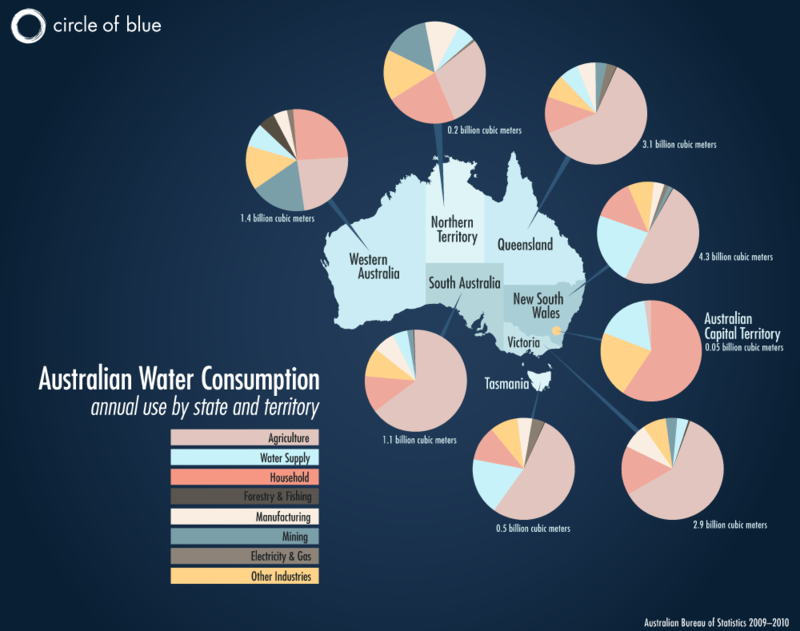 Map of water use by each Australian state and territory broken down into sectors. Click to see larger image. The mining and drilling industries respond that they are bringing billions of dollars in royalties, income taxes, and export earnings, as well as creating local jobs and boosting demand for a range of local goods and support services. “New South Wales can have a safe and sustainable coal seam gas industry that co-exists with agriculture and delivers real economic benefits to the wider community,” James Baulderstone, vice president for Santos, said in a February 2012 news release. In a recent report, Santos said that its plans to develop the coal seam gas reserves of northwest New South Wales, including the Liverpool Plains, could deliver a AUS$ 821 million per year boost to the state’s economy through 2035 and create about 2,900 ongoing full-time jobs. In neighboring Queensland, where the coal seam gas industry is soaring, the state’s government estimates that the gas projects will create around 18,000 direct and indirect jobs and generate around AUS $1 billion per year in state revenues. Though coal seam gas industry executives assert that their drilling practices are responsible and that opponents exaggerate the potential for damage to water resources, Duddy is not convinced. 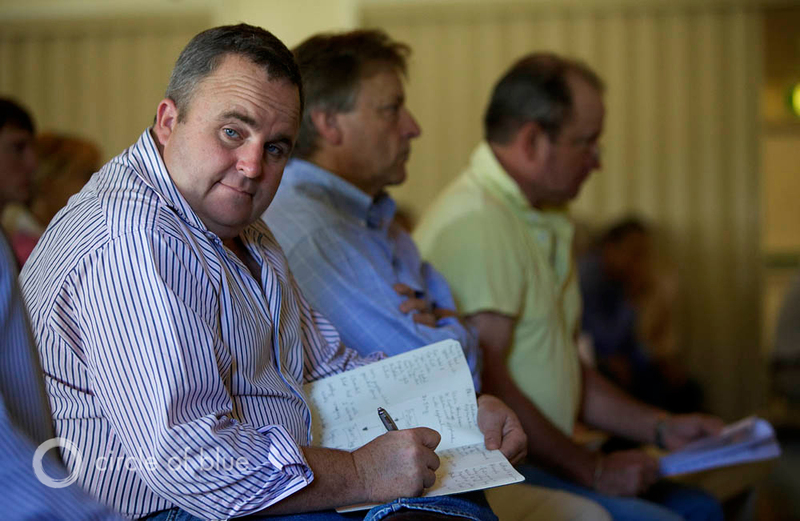 Tim Duddy, a Liverpool Plains farmer and spokesman for the Caroona Coal Action Group, avidly takes notes at a community meeting on coal seam gas exploration in Mullaley, New South Wales. The promise of big gas reserves is producing fresh public concerns here about the consequences for aquifers and streams traditionally tapped for drinking and irrigation. Nearby, Duddy’s cousin Rosemary Nankivell — a farmer here in the Liverpool Plains, with 2,200 hectares (5,400 acres) of land and 1,000 heads of cattle — is busy typing e-mails, posting Twitter updates, reading Google alerts, and writing statements to the government, the energy industry, and the farming community. What Nankivell has been doing is rounding up the troops. Last October, she helped mobilize more than 150 people for a three-week blockade to stop the drilling of a coal seam gas exploration well in the Liverpool Plains. 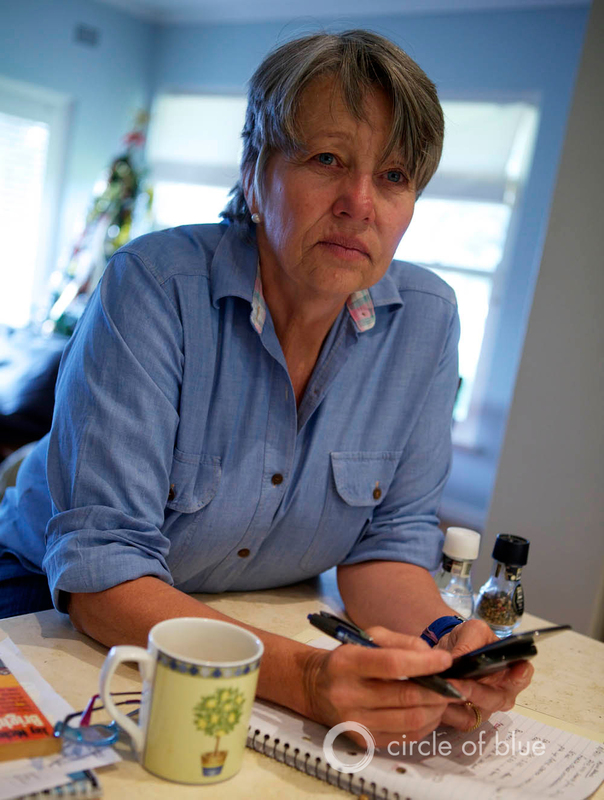 Rosemary Nankivell, a farmer on the Liverpool Plains, sits at the edge of her kitchen counter. Nankivell is a spokeswoman for the Caroona Coal Action Group and is vigorously fighting to slow and prevent coal and coal seam gas development here. Nankivell believes that farmers in New South Wales will be more resistent than their neighbors in Queensland, since most families in her distrcit have been here for many generations. She calls it a “district ethos” — farmers here pass property on to the next generation. This is the second story in a three-part series about Australia’s coal and coal seam gas boom. Read the first story on the global demands that are driving Australia’s coal and gas export boom. Reporting in Australia was supported in part by an Eric Lund Global Reporting and Research Grant at Northwestern University’s Medill School of Journalism. Aaron Jaffe is a Chicago-based multimedia producer for Circle of Blue. Amanda Northrop is an undergraduate student at Grand Valley State University and a Traverse City-based design intern for Circle of Blue. Reach them at circleofblue.org/contact. Bronx water-filtration plant a fiscal sinkhole?